SWiPE organised Society, Diversity and Markets seminar on the role of ethnic minorities in society and markets at the Turku School of Economics on 17 October 2018. The event gathered together researchers and industry experts to a lively discussion. 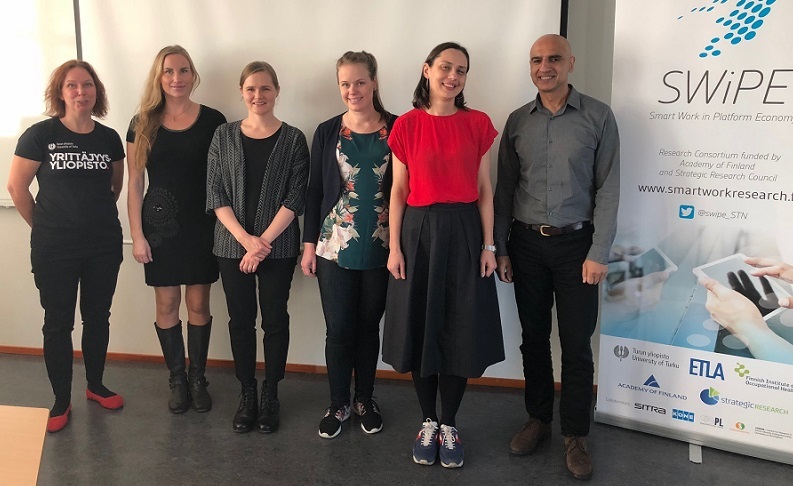 The keynote speaker of the seminar was respected British researcher Monder Ram who is also a researcher at SWiPE research project and a visiting professor at the Turku School of Economics in the department of management and entrepreneurship. The keynote speaker of the event, Professor Monder Ram from the University of Aston in Great Britain, particularly emphasised the widespread societal importance of promoting immigrant entrepreneurship. Monder Ram pointed out that immigrant companies have significant social and economic repercussions from a social and economic perspective. In particular, the social impact of immigrant companies, in his opinion, is often overlooked consciously or unconsciously. – It is also important to look at the latent effects of immigrant entrepreneurship in society, Ram pointed out. It is also important from a political point of view. Monder Ram specifically underlined the many roles of superdiversity and immigrant companies in addition to business and economic impact. In his own research, it is important for him to genuinely understand immigrant entrepreneurs, which originates from discussions with immigrant entrepreneurs. Magdalena Kmak, Associate professor from Åbo Academy, brought to the debate, in particular, her visions of the precarization of immigrants and the way in which the European countries’ border and nationality practices create inequalities. On the other hand, she emphasised that precarization is not only a societal issue concerning immigrants. Researchers Anu Yijälä and Tiina Luoma from the project Polkuja työhön, project of Strategic Research Council, reported on their study of the impact of unemployment and employment on the wellbeing of immigrants. The interview survey study has examined the social pathways of immigrants and the importance of working for their wellbeing. Yijälä and Luoma said that work is important for the wellbeing of immigrants and the whole process of acculturation. Employment contributes to the gaining of cultural capital of the new country. On the basis of their research findings, they stated that the reception of financial supports is perceived as challenging and that all work is good, as it will also help to further the employment of immigrants later on. The research results can be explored more specifically in the research report “En halua istua veronmaksajan harteilla, haluan olla veronmaksaja itse” (in Finnish). Ph.D student Maria Hokkinen explained from the point of view of consumer research how the consumption of immigrants looks and what contradictions it poses in the Nordic welfare society. According to Hokkinen, the concept of refugees is based on both old-fashioned views and media’s categorizing of what the refugee should look like. In her study, Maria Hokkinen found five types of conflict, based on the consumption of refugees. They underline, among other things, the perceived threat of immigrant consumption habits to locals, the suspicion of abuse of social benefits and the accusation of the welfare system as an enabler of immigrant consumption. SWiPE researcher Satu Aaltonen acted as moderator of the seminar. Aaltonen researches the promotion of immigrant entrepreneurship in Finland. She led a lively discussion arised from the presentations, including on how immigrants and immigrant companies could be utilized better in the development of a more diversified society. Society, Diversity ja Markets -seminar speakers (from left to right) Satu Aaltonen, Anu Yijälä, Tiina Luoma, Maria Hokkinen, Magdalena Kmak and Monder Ram.